Are you curious how straightforward it is to perform PEPperCHIP® Peptide Microarray assays with your antibody, serum or plasma sample? 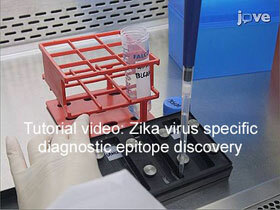 Check out the new tutorial video by Prof. Daniel Malamud (New York University) and his colleagues about Zika virus specific diagnostic epitope discovery, showing all assay steps from microarray handling, incubation with diluted serum, microarray read-out to final data analysis with PepSlide® Analyzer. If you lack the technical infrastructure, please note that PEPperPRINT also offers the comprehensive PEPperMAP® Service package including all lab and computer work to the delivery of a detailed scientific report. For more information about PEPperCHIP® Peptide Microarray assays and analysis including protocols and the required lab infrastructure, please visit this website.